Australia has passed into law a policy that will tax companies for every carbon emission that they will make starting next year at a fixed price of $23.7 per ton for three years. That is, until 2015, when rates become flexible (Knight 2011). This is another milestone for the worldwide consensus to reduce Green House Gas (GHG) emissions. The United Nations Framework Convention on Climate Change (UNFCC) provides the necessary support for this international effort. UNFCC was a result of a global agreement forged in 1992 which aimed to reduce GHG emissions to keep the earth’s temperature at safe levels (UNFCC n.d.). However, to make UNFCC legally binding, an international treaty was needed. This will later come in the form of the Kyoto Protocol which was adopted by majority of UN member countries in 1997, excluding the United States. The Kyoto Protocol pushes developed countries to achieve GHG emission reduction targets by 2020. The Guardian reports that globally, emissions have increased by almost 40% from 1990 to 2009 (The Guardian 2011). Currently, a deadlock exists between developing and developed countries with regard to the amount of reductions as well as the parties to take on the prescribed measures. Developing countries have demanded financial assistance from the big players (US, European Union, India, China, etc.) for the development and expansion of renewable energy sources in their territories. At the same time, they also want to see the plans for GHG emission reduction of the developed countries. Developed countries on the other hand, want to be assured of the developing countries’ commitment to make the huge cuts in their GHG emissions. The reliability of measurements to be used to assess the progress of each country also remains a point of contention (Harvey 2011). In the Copenhagen summit of 2009, developed countries have promised to produce the money needed for the global energy sector reform but have not been delivering, with many of the concerned parties blaming the current economic crises in the EU and in the US (Goldenberg 2010) (Harvey 2011). Nonetheless, European countries claim the ability to reach their target levels by 2012, the deadline for the Protocol’s first commitment. For its part, Germany has recently launched a grant facility dedicated “to strengthen its bilateral cooperation with developing, newly industrializing and transition countries in the field of climate protection”. Further, it had expressed its support for “a comprehensive global climate agreement” under the UNFCC (Federal Ministry for the Enivironment, Nature Conservation and Nuclear Safety 2011). Similarly, China has made significant leaps forward, becoming the lead player in the clean energy technology industry (The Guardian 2011) (Harvey 2011). But the World Resources Institute revealed that developing countries are leading the pack in adopting renewable energy policies (MANIEGO and WEISCHER 2011). For instance, the Philippines, bereft of fossil fuel resources but fortunately having abundant renewable energy supply, already derives 30% of its energy requirements from the likes of geothermal, hydro, solar, and wind power electricity facilities. It is said to be the second largest producer of geothermal power worldwide and the first in Southeast Asia to use large-scale wind and solar technologies. Policy-wise, the country has adopted the Renewable Energy (RE) Act in 2008, which guarantees a fixed price for 12 years for energy sourced from renewable sources. This is just one of its attractive incentives for consumers and possible investors (Pérez 2009) (MANIEGO and WEISCHER 2011). The United Nations Environment Programme even commented that the Philippines’ RE law could serve as the region’s blueprint form renewable energy policy (Pérez 2009). Thus, policies in this context play a major role in advancing international agreements at the local level. Moving forward, the challenge becomes more daunting and costly. The past decade has shown us how diplomacy and economic interests can derail the massive task of reducing GHG emissions. It takes a great amount of political will to enforce policies at the local level that can improve existing renewable energy sources and force industries to shift to more sustainable energy use and management. A study entitled the “Implication of Population Growth and Urbanization for Climate Change” explains that the number of consumers and their growing levels of consumption prove to be the “driving force” in the increasing rates of GHG emissions, more than the production processes. Hence, aside from the production perspective, the paper seeks to establish the contributions of households to GHG emissions and encourages further study on the matter (SATTERTHWAITE 2009). This tells us that States should also discourage its citizens from engaging in wasteful consumption. More importantly, at the heart of all initiatives toward the development of renewable energy sources is the quest for energy security. While the full utilization of renewable energy can be more cost-efficient in the long run especially for non-fossil fuel producing nations, the shift will be expensive, especially for countries that are heavily reliant on them. But what is being communicated by the UNFCC is that, whether nations admit it or not, we are all in the same sinking boat. And unless we all do our share to save the ship, the consequences will be irreversible and tragic. All eyes are now set towards 2020, by which time another protocol will be drafted, the goals of which would greatly depend on the success or failure of the current international treaty. For the Philippines, it gives us a sense of hope because we have the most expensive electricity in Asia (Manila Bulletin 2011), and finding alternative sources for electricity would also mean attaining self-sufficiency in terms of energy. The landmark legislation in Australia is another victory for renewable energy advocates. More developed countries should seriously take their share of the burden as more developing countries strive to develop their renewable energy sources. Only then can we move forward. This is not a new message. But it appears that there is more need to push the developed countries to act. It is indeed ridiculous to know that the US bailed out banks for 800 billion dollars, yet refuses to spend a considerable amount for its climate change program. Resources are there; the question is how fast the countries can move to make broad and structural impacts. Federal Ministry for the Enivironment, Nature Conservation and Nuclear Safety. International Climate Initiative. 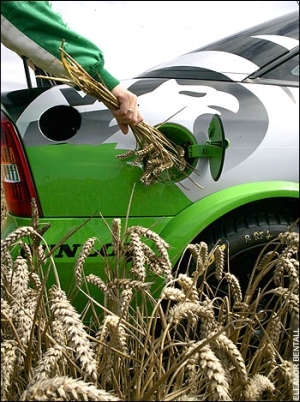 October 2011. http://www.bmu-klimaschutzinitiative.de/en/selection_procedure (accessed November 14, 2011). Goldenberg, Suzanne. The Guardian. December 07, 2010. http://www.guardian.co.uk/environment/2010/dec/07/cancun-summit-climate-aid-row (accessed November 14, 2011). Harvey, Fiona. The Guardian. November 03, 2011. http://www.guardian.co.uk/environment/2011/nov/03/climate-talks-china-developing-countries (accessed November 13, 2011). Knight, Matthew. CNN Asia. November 08, 2011. http://edition.cnn.com/2011/11/08/world/asia/australia-carbon-tax-passed/index.html?hpt=ias_c2 (accessed November 11, 2011). MANIEGO, PETE, and LUTZ WEISCHER. Manila Bulletin. July 04, 2011. http://www.mb.com.ph/articles/325264/the-right-mix-the-philippines-achieving-its-renewable-energy-goals (accessed November 14, 2011). Manila Bulletin. Manila Bulletin. February 23, 2011. http://www.mb.com.ph/node/305841/philippine (accessed November 14, 2011). Pérez, Vincent S. “ADB Documents.” Asian Development Bank. 2009. http://www.adb.org/documents/events/2009/CCEWeek/Presentation-Vincent-Perez-Energy-PHI.pdf (accessed November 14, 2011). SATTERTHWAITE, DAVID. “The implications of population growth and urbanization for climate change.” Expert Group Meeting on Population Dynamics and Climate Change, UNFPA, IIED and UN–HABITAT. London, June 24–25, 2009. The Guardian. March 11, 2011. http://www.guardian.co.uk/environment/2011/mar/11/kyoto-protocol (accessed November 13, 2011). UNFCC. United Nations Framework on Climate Change. http://unfccc.int/essential_background/items/6031.php (accessed November 13, 2011). Asia Society for Social Improvement and Sustainable Transformation (ASSIST), has signed a memorandum of understanding with General Carbon Advisory Services, a private sector organization specializing in providing strategic, technical and financial services across major energy and environmental commodity markets. General Carbon was represented by Dr. Ram Babu, who holds 35 years of experience working in the field of environmental impact assessment, environment management, corporate governance and benchmarking and energy efficiency. In particular, Dr. Babu has a solid background in developing Clean Development Mechanism Projects. Meanwhile, ASSIST was represented by Group Managing Director Sreenivas Narayanan. Senator Pia Cayetano graced the Focus Group Discussion with Family Court Judges on the use of RA 9262 and other laws on VAW (Violence Against Women) held last November 17, 2011 at the Pecson Room of the Philippine Senate for the Justice and Healing project funded by the European Union (EU). Held in partnership with the Office of Senator Cayetano and the Philippine Commission on Women with the Inter-agency Council against Violence Against Women (IAC-VAWC), the goal of the discussion was to draw insights from the experience of judges in the litigation of the aggressors and administration of justice. For her part, Sen. Cayetano shared her efforts in promoting women’s rights and raised points for the purpose of sponsoring amendments to further strengthen laws on VAW, in her capacity as the Chairperson of the Senate Committee on Youth, Women and Family Relations. The Zero Carbon Resorts Project funded by the European Union’s SWITCH Asia Program held a Technical Training in Almeria, Spain hosted by partner organization Plataforma Solar de Almeria (PSA) last November 1 to 10, 2011. Launched as part of the advance course for the Replace Phase of the project, it gathered engineers and architects from the academe, private industry and government institutions to learn from the techniques and experience of PSA in the field of solar energy. Participants were equipped with theoretical knowledge and practical work on various solar technologies employed by PSA. They are expected to serve as resource persons of the project, echoing their learning in their respective professions. A workshop was also held at the end of the training to let the participants identify, assess and recommend equipment that can be used to promote zero carbon resorts in the Philippines. Drs. Julian Blanco, Diego Alarcon, Pilar Fernandez and Guillermo Zaragoza of PSA, and Dr. Robert Wimmer of Gruppe Angepasste Technologie (GrAT) facilitated the training. The training also served as a venue for the meeting of partner organization representatives: Dr. Wimmer, Engr. Catherine Guivencan, Engr. Eric Raymundo, Mr. Gerald Englmair, and Mr. Chaipipat Pokpong of GrAT (Project Lead), Ms. Marivic Mamaradlo of Asia Society for Social Improvement and Sustainable Transformation (ASSIST), Mr. Romeo Dorado and Ms. Maria Luz Martinez of Palawan Council for Sustainable Development (PCSD), Mr. Armando Miranda of Tourism Infrastructure and Enterprise Zone Authority (TIEZA). Structured Program to Achieve Food Safety Excellence in Cambodia (SAFE Cambodia), a Public-Private Partnership (PPP) initiative of TUV Rheinland and Asia Society for Social Improvement and Sustainable Transformation (ASSIST) conducted a training of trainers (TOT) for Food Industry Practitioners on October 3 to 8 in Siem Reap, and October 10 to 15 in Phnom Penh. Focusing on the Hazard Analysis and Critical Control Points (HACCP) module, the session featured an introduction to the approach, the prerequisite programs (PRPs), and the extensive discussion on the 12 logical steps to its application and implementation. The HACCP training aimed to equip the food safety trainers with the skills at system implementation. These were reinforced through a combination of lectures as well as group discussions and workshops which covered each of the steps on hazard analysis, and the process for developing a per-product HACCP plan. In keeping with its advocacy for sustainable development, Asia Society for Social Improvement and Sustainable Transformation (ASSIST) joined the Philippine-German Solar Energy Forum on November 21 at the Peninsula Manila, whose theme was Tapping the Potential of Solar Energy in the Philippines. The forum tackles how the German photovoltaics (PV) technology can address the country’s need for reliable access to power, cost-effectively. It also recognizes the country’s excellent natural conditions for the use of solar energy – especially in the remote areas. 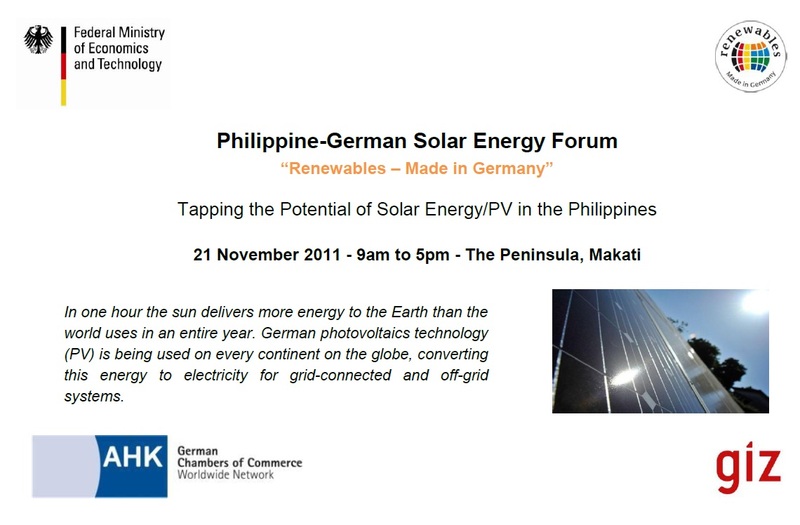 Organized by the German Federal Ministry of Economics and Technology, the forum featured a group of global technology leaders from Germany talking about the PV innovation, the potential of the Philippine market, and developing the solar industry from an SME perspective. The activity was graced by European Chamber of Commerce in the Philippines (ECCP) VP for Externals Henry Schumacher, German Philippine Chamber of Commerce and Industries President Reiner Allgeier, GIZ Deputy Country Director Wolfgang Möllers and Coordinator Volker Steigerwald, German Embassy Representative Christof Wegner, Philippine Solar Power Alliance (PSPA)’s Tetchi Capellan, and German Solar Industry Association (BSW-Solar) Project Manager Jan Knaack.